The Captain Nichola Goddard Fund provides national funding to directly benefit community programs that support servicewomen, female Veterans, and their families, which help address the unique challenges related to military life. Captain Nichola Goddard was killed at age 26 during an ambush west of Kandahar city on May 17, 2006. 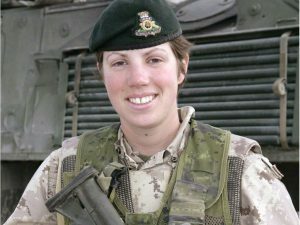 While she will always be remembered as the first female Canadian soldier to die in a combat role, she has also become a symbol of the leadership, strength and courage of Canada. To make a donation to the Captain Nichola Goddard Fund, click here. This fund will provide essential programs for servicewomen, female Veterans and their families, to help address the unique challenges related to military life. Please see below for eligibility criteria. Programs that have been identified as high priority need for service women, female Veterans and their families. Programs that support women in the military and women transitioning out of the military. Programs that support military families struggling with the challenges of a military lifestyle. Preference will be given to community based programs able to demonstrate an evidence-based or evidence-informed program delivery. Collaboration with established civilian or military organizations able to provide expertise is encouraged. Applications must be received during the application window. NOTE: This is a national fund. Special consideration will be given to the regions of Northern Canada and the Atlantic provinces where Nichola Goddard was raised. In addition to the eligibility criteria noted above, preference will be given to projects that address and provide details on the requirements below. The Captain Nichola Goddard Fund provides annual funding. The grant cycle will open twice a year – once in the Spring and again in the Autumn. The Captain Nichola Goddard Fund may provide a grant amount for less than that requested; when this happens, the grantee must submit a revised budget within the amount approved. An interim impact report and/or final impact report are mandatory for the Captain Nichola Goddard Fund.